POWER PROBLEMS? WE HAVE TWO POSSIBLE SOLUTIONS – "Danilo Amelotti"
In the modern era batteries are one of the most required items of any soldier/security operators etc. If we go backward in the 90s, any operator would have required batteries only for its flashlight and radios, or for some new weapon devices (as in instance the illuminators or laser point). Within the time and the technological development, more and more electronic devices have been introduced in our daily routine and of course into the operational world. Today we can count GPS, Mobile Phones, Cameras, NVGs tablet etc that are constantly on the rucksack of any operators. As a result of this technological development, the need to have quantities of batteries in our backpacks drastically increased, to the point that operators have started to remove other equipment from their rucksack in order to gain room for batteries. If that was not enough, some of the equipment nowadays in use don’t have the possibility to change the batteries, or have specific battery pack that can be recharged only by the use of specific docking station or a USB connection. In instance, devices such as mobile phones and tablets exploit only a single non-replaceable battery forcing the owners to connect to a power source whenever possible. What about Military, security and rescue people that have not opportunity to recharge their electronic devices every some hours, or that have not huge rucksack full of batteries? Well the solution come from several other energy suppliers… in the today article I would like to introduce two different power sources, that for dimension, weight and efficiency, I personally consider one of the main important tool that all operators or “out door” fans, should have into their rucksack. A solar panel is an important item that hikers and campers today include in their backpacking “musthaves” list. Aside from the obvious food rations and temporary shelter, a solar panel is now considered an essential backpacking gear as it delivers the needed energy to charge electronic devices that people would like/have to carry with them during long outdoor trips. Solar panels are portable power stations that harness energy from the sun. Its main function is to charge low-energy draw electronic devices when there are no power outlets available. The mobile quality of solar panels makes it the perfect operational/outdoor source of renewable energy. Not only are solar panels for backpacking purposes only, but military and security personnel, when employed in areas where power outlets are really the very last things that they could find can also utilize them. Of course, meanwhile for backpackers there are really no restriction in the use of such power devices, the “tactical people” have to consider also their mission and the tactical condition in which they will be when using such power supplier. In instance, since a solar panel have to stand under the sun in order to provide energy, it won’t be possible to use it when in a tactical OP… the light refraction caused by the solar screen would certainly show to the enemy the OP position with all bad future consequences. On the other hand, an operators that stand in an obvious situation, such us check point, base defense, open patrol etc, will have the opportunity to use this power supplier to recharge its electronic devices or an auxiliary battery pack, that will store energy for the night hours or when anyway won’t be possible to use the solar panel. 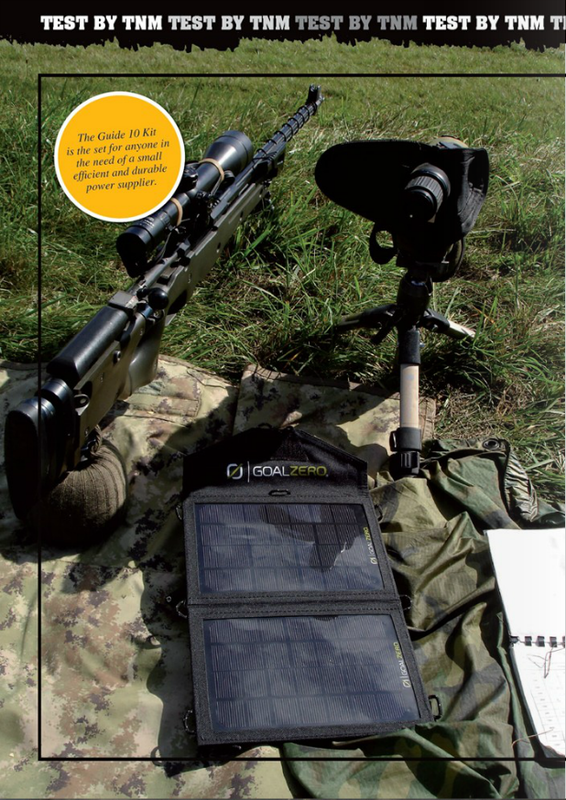 Talking about solar panel it seems to be obvious present one of our tested equipment, the Goal Zero 10 Plus or Guide 10. Although not yet built in a specific Military outfit, the Guide 10 can be considered one of the best solutions as above mentioned. The Guide 10 Kit is the set for anyone in the need of a small efficient and durable power supplier. Fitted with a small 16.5 x 23 x 4 centimeter solar panel, this unit can power and recharge mobile phones, GPS devices and cameras for several hours. If an electronic device requires no direct power supply, the energy captured in the power pack‘s own rechargeable battery set is stored for when it‘s needed next. With Guide 10 you can plug most USB devices directly into the panel to charge them. At the same time, you can also attach the included 12 volt cigarette adapter to the panel and charge a second device. Good feature of G10 is the pocket that allows to store chargers, cords or the Battery Pack. Furthermore it allows you to keep the device you are charging in the pocket, which comes in handy if you need to hang the panel up off the ground and of course when you want to keep all your equipment ready for a “quick departure”. If your panel does not have a pocket you will need to have an extra stuff sack. Other good feature is the abundance of built-in nylon loops for hanging the panel. Using them is also possible to hang the solar panel at the rucksack and recharge any device in the while of moving from A to B. the last very good part is the light weight AA battery charger included in the kit. With this very well designed charger it is possible to recharge any AA rechargeable batteries (from our test full charge in about 2 hours). Furthermore, it can be used also as charger when sun is missing or when in the needs of recharge multiple devices, and it also has an included flashlight. As probably not so great info, although this panel does a great job of charging small devices, it won’t charge an iPad or larger devices. What to do if we are in a tactical operation and we still need to recharge our devices? Well as mentioned before, the use of a solar panel is really not recommended. Well an innovative company found and creates a system that can really support us also in such condition. How to describe this product; well, this is a real unique and revolutionary system to recharge our devices. In fact, it is a revolutionary portable charger that by it self, generates electricity from water (based on Swedish Fuel Cell technology). it actually produces the electricity you need using the hydrogen from the water and converting that into electricity and can therefore deliver instant, reliable power. 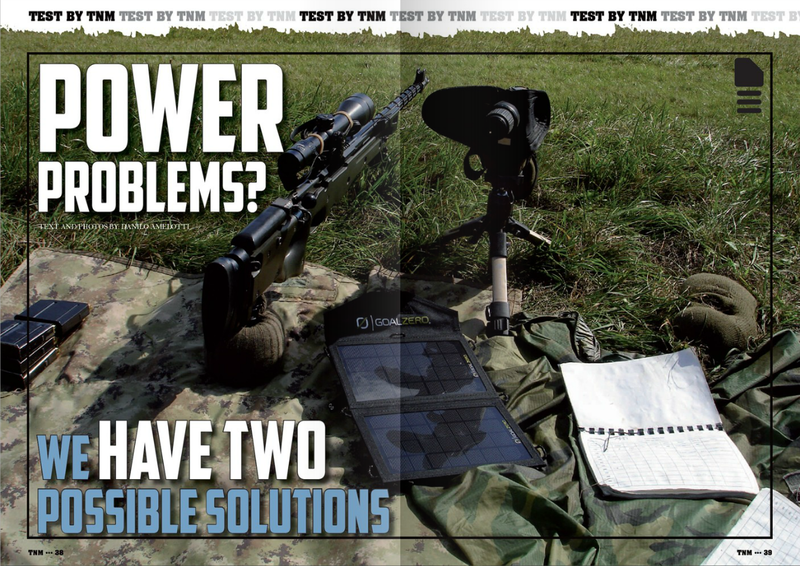 Differently from Solar panel, Powertrekk can be used anywhere, anytime, any weather, therefore in all tactical/operational/training situation, without the risk to be compromised by solar refraction, and without the limitation provided by the need of direct solar exposition. With one myFC Puck and a little bit of water you will get 1200 mAh (4 Wh). 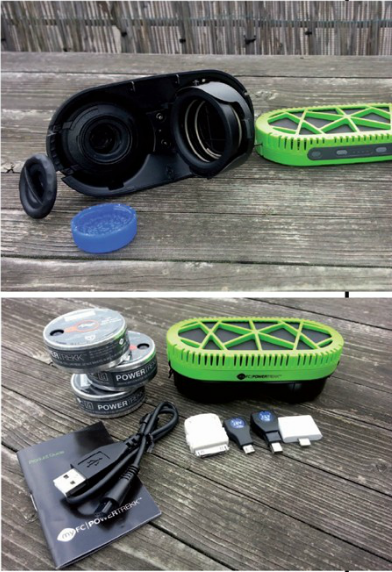 The internal battery contains 1500 (5 Wh) mAh, which you can choose to charge either via the Fuel Cell (water and a Puck) or via the electrical outlet, when you’re close to one. 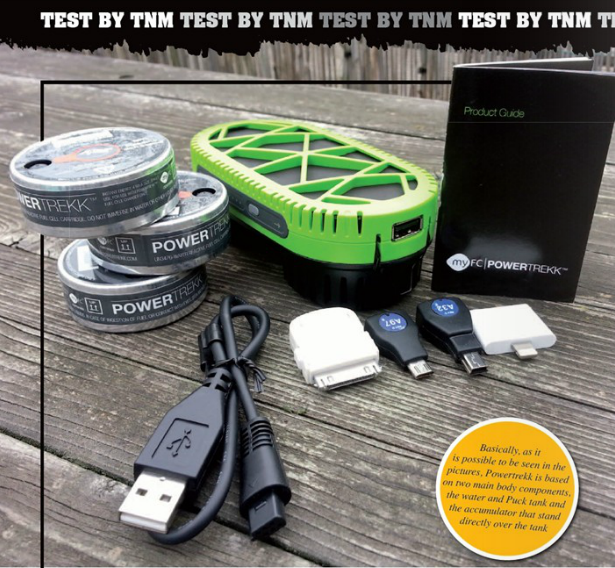 From our test, carried on in several different conditions, Powertrekk has always been able to fully recharge (starting from off mode and no more power) our mobile phones, or a battery pack of 4 AA batteries in less than three hours. As it is possible to infer from the pictures, Powertrekk has not yet been designed (as colour) for military environment, in fact I believe to have been the first person asking to the company if they had a military line! Apart from this “little” problem, we did not really found other main concern on the use of this great and innovative product. As for Goal Zero 10 Plus, also Powertrekk as a certain limitation on the chargeable devices, in fact due to the limited power produced it cannot recharge Tablet or other similar power consumption devices. It is quite difficult to say which one is the best; in fact, if the solar panel is definitely cheaper (119 Euro or 163 US$ for Goal Zero and 199 Euro or 270 US$ for Powertrakk with three Pucks ) and required only the sun light to produce power, the Powertrekk can really be used in any condition. Probably the best choice have to be done based on our mission/ task/need, but in any case I would probably save a little bit more of my money and I would anyway buy both of them.